From a competitive standpoint, it appeared the St. Louis Blues had more incentive, will and determination than the Arizona Coyotes in this one. Certainly, the Blues displayed a quick, all-around game, and knew there was a great deal at stake. Ditto for the Coyotes, only Arizona did not show the kind of drive and resolve they desperately need. With the Blues near the top the Central division, the Coyotes are fighting for their playoff lives, and did not need a clunker at this point of the season. While the Coyotes are busy walking a tightrope, the Blues have their sights directly on the Chicago Blackhawks, leaders in the Central. Scoring four goals on their first seven shots of the game, the Blues parlayed a porous Arizona defense into a 6-4 victory over the Coyotes before 15,839 Saturday in Gila River Arena. The four goals allowed by Arizona in the opening period equaled a season mark for a fourth time, and last time this happened was against the Kings on Feb. 2. With the win, the Blues move to within two points of the Hawks for the Central lead. The loss snapped a modest two-game Arizona winning streak, and put the Coyotes in a precarious position. Now facing a challenging five-game road trip, their most important journey of the season, the Coyotes have 60 standing points and trail Colorado by four points for the final Western Conference playoff spot. Down 4-1 less than 8-minutes into the game, the Coyotes let the opportunity to gain important points slip away. Plus, the effort transpired without defenseman Oliver Ekman-Larsson, who when down with a right knee injury less than 1-minute into the game. Approaching each game as a desperate team, the Coyotes wanted to get off to a fast start against an elite hockey squad, and maintain the tempo. What made this Coyotes assignment particularly difficult was facing Blues’ goalie Brian Elliott. Coming into the game, Elliott had the best goals against average in the league (1.99) and against the Coyotes, started a career-best 16th straight game. In the end, Elliott gave up four goals. As well, the Blues’ net minder tied the most goals he allowed in any game this season. On Dec. 4 at Chicago, he surrendered four goals. 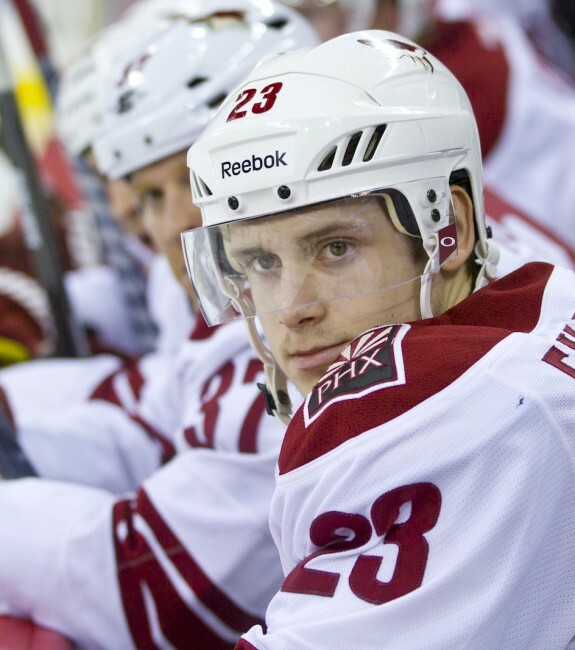 If the Coyotes needed to dent Elliott’s armor, this would have to happen early, and for two reasons. First, the goal would give the Coyotes an important early lead and confidence, and prove Elliott could be beaten. When Shane Doan scored on a wrap-around just 23 seconds into this one, that actually happened. As quickly as Doan made Elliott think, the Blues caught a break, and went on the power play. That’s when Ekman-Larsson was called for tripping and injured on the play. Ekman-Larsson immediately left the ice limping, and it appeared he twisted his right knee. The Blues took immediate advantage. That’s when Vladimir Tarasenko fired behind David Backes’ screen for his 28th of the season, and the Blues knotted the match at 1-1 at just 1:08 into the game. What followed for Arizona was an aberration. St. Louis managed three goals in just six and one-half minutes, and that forced Tippett to pull starter Louis Domingue. At the start of the second period, Tippett put Domingue back between the pipes and the rookie net-minder responded. Though he allowed only a third period goal by Patrik Berlund, who converted a perfect Scottie Upshall pass into his fifth of the season mid-way through the final period, Domingue said he challenged himself. When pulled in the first period, that event commenced Domingue’s thinking process. According to Tippett, Domingue better be ready in the coming 10 days. That’s because the Coyotes now embark on their most important road trip of the season. That begins against the Capitals on Monday night, and includes stops against the Lightning, Panthers, Flyers and Penguins. Though Tippett and others say the up-coming trip should not truly define their season, it’s a better than even bet this trip will clearly define their season. Though Oilver Ekman-Larsson was noticeably limping down the runway to the Coyotes dressing room, coach Dave Tippett indicated the All-Star defenseman wanted to return to the game. Against the advice of the Coyotes’ medical staff, that did not happen, and Tippet indicated Ekman-Larsson is now day-to-day. To compensate for the loss of Ekman-Larsson, defenseman Klas Dahlbeck played 24:21 and Connauton played 31:11, career highs for each player. The Coyotes begin that important five-game road trip Monday night against the Capitals in the Verizon Center.